You're such an awesome writer, I must tell you. I enjoyed all of your books. How did you get into self publishing? Thank you so much! 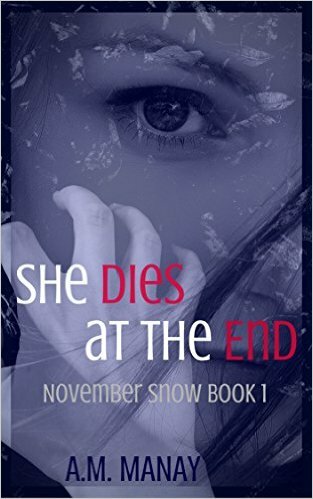 I began writing about November Snow because I was feeling isolated and bored at home when my son was a toddler. As the book grew and took on a life of its own, my husband encouraged me to try to get it published. I decided to self-publish after I had no success finding an agent interested in my work. I screwed up my courage and published it myself, not knowing how it would be received. I've been thrilled with the fact that people seem to enjoy my stories. I've found being an indie author to be a rewarding adventure and a wonderful creative outlet. Who is your favorite fantasy author? Which book? Hmm . . . I don't know if I can pick just one. I've liked different things in different stages of my life. When I was a kid, I adored anything by Anne McCaffrey, especially the Dragonriders of Pern books. I suppose my favorites as an adult are Tolkein's The Lord of the Rings trilogy. I'm also an unapologetic J.K. Rowling fan. My favorite Harry Potter volume is probably The Prisoner of Azkaban. Recently, I really enjoyed A Discovery of Witches by Deborah Harkness, I think because it combines my two loves: historical fiction and supernatural fiction. I suppose the commonality among my favorite writers is the richness of the worlds they created and the vividness of their characters. That's what I love to see in any genre. Your writing can be compared to the work of authors like Deborah Harkness. I got hooked on her series myself. 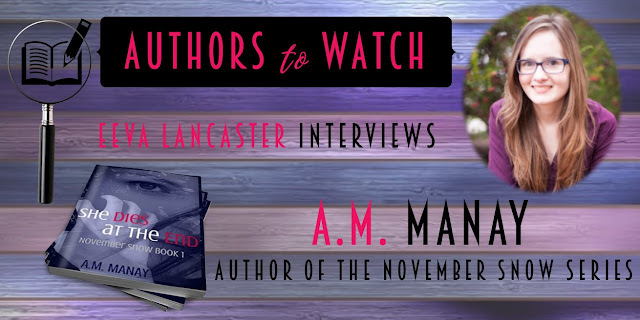 Tell us something about A.M. Manay, the woman. What are you like in person? I'm tougher than I look. I have a wonderful husband and a 6-year-old son whom I adore. I'm funny and friendly but a tad reserved. I'm a little messy. I get impatient with foolishness and irrationality. I'm a bit of a perfectionist and a little too hard on myself. I enjoy movies and television as well as books, naturally. I have a chocolate addiction, and I'm way more interested in politics than is good for my mental health. I love music, coffee with friends, and, of course, time with my family. If you could do one thing differently what would it be? In life or in writing? In life, I wouldn't have made myself so stressed about my grades in school. I drove myself quite hard, and I was very tightly wound. I think I'd have been a much happier child if I had just been a little lazier. In writing, I would have tried to make author and reader friends before I published my first book instead of afterwards. I think one of the most fun things about writing is connecting with readers and with fellow authors. And I would have started writing a lot sooner than I did. What do you do before releasing your novel to the world? I give it to beta readers and I listen carefully to their feedback. I edit very carefully. Then I cross my fingers and hope for the best. What do you think is the most effective strategy to bring your book closer to your readers? That's a good question. I wish I knew the answer! I try to maintain a robust online presence and to never say no to an opportunity to reach a new group of people with information about my writing. Based on your experience, name 3 things that are MUST-DOs in self publishing. 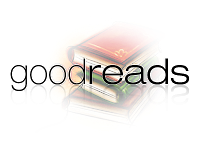 You must read other self-published work: the good, the bad, and the ugly. You learn from the pros as well as from the mistakes of the less-skilled. You must have proofreaders and beta readers to help you fix problems before you publish. You must proofread your work on paper. The screen is nowhere near good enough, especially when it comes to formatting a paperback. Are you taking steps to get a publishing contract? I'm not looking at the moment. For my next series, I might try to find a small press. Now that I've had the complete do-it-yourself experience, I'd like to explore other options. Perhaps traditional publishing folks will be more receptive now that I have some reasonably well-received books under my belt. What's next for the November Snow series now that She Lights Up the Dark has been released? What's on the pipeline? I'm going to do one more book with November, which I've just started writing. 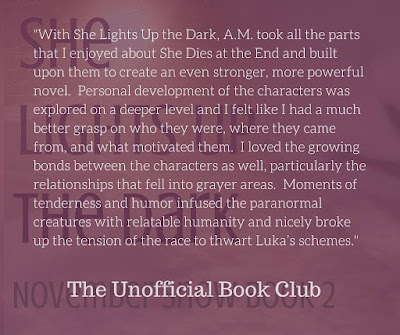 There is a lot of fallout from the events in She Lights Up the Dark to deal with! After that, I have an epic fantasy series in the planning stages. Yumyum. I love epic fantasies. What's the best part of being a self published author? I think it's a tie between the joy of imagining and creating and the satisfaction of connecting with readers and fellow writers. If you could speak to all self published authors, what would you tell them? I would say that you have to be brave and put yourself out there, and you have to be generous with your fellow writers. You have to build those relationships with a giving attitude. Those connections with your peers are so valuable in terms of encouragement and support. Such communities also provide you the opportunity to hone your craft and to market more effectively. Thank you for your time! 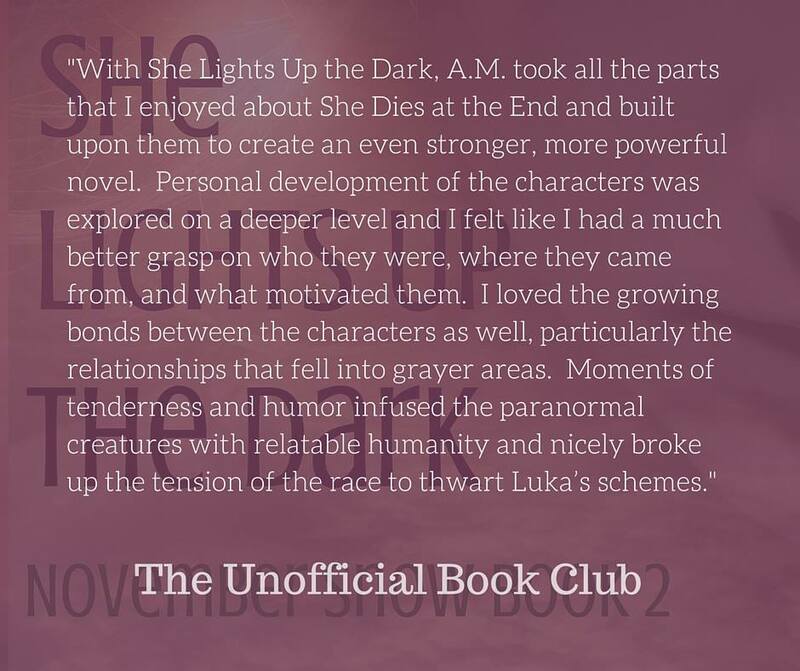 and Congratulations on the release of She Lights Up the Dark. I wait anxiously for Book 3. Do you love supernatural fiction? Check out her books and tell me if I'm lying. Start with She Dies at the End.